Cronyism is partiality to long-standing friends, especially by appointing them to positions of authority, regardless of their qualifications. Cronyism exists when the appointer and the beneficiary are in social contact. Often, the appointer is inadequate to hold his or her own job or position of authority, and for this reason the appointer appoints individuals who will not try to weaken him or her, or express views contrary to those of the appointer. Politically, "cronyism" is derogatorily used. 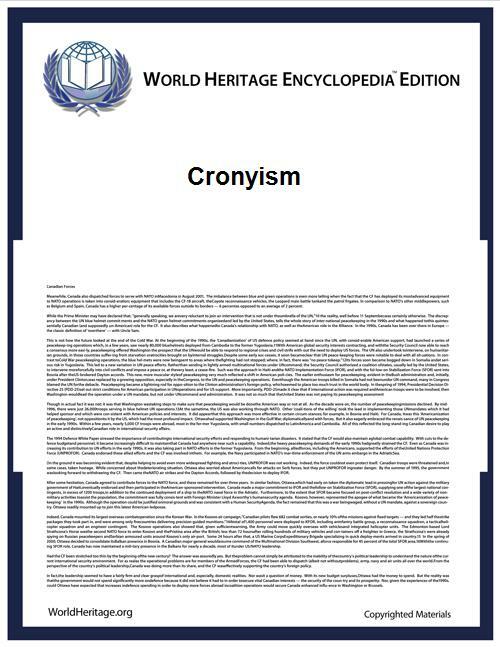 The word "crony" first appeared in 18th century London, according to the Oxford English Dictionary to be derived from the Greek word chronios (χρόνιος), meaning "long-term". The word crony also appears in the 1811 edition of Grose's Vulgar Tongue with a decidedly non-collegiate definition, placing it firmly in the underworld. Another oft-quoted source is the supposed Irish term Comh-Roghna , said to translate as "close pals", or mutual friends. However, this term apparently originated with Daniel Cassidy (fabricator of many fake Irish terms) and is completely unknown in the Irish language. (See Ó Dónaill's Irish-English Dictionary p. 288, where the term is conspicuously absent). Governments are particularly susceptible to accusations of cronyism, as they spend taxpayers money. Many democratic governments are encouraged to practice administrative transparency in accounting and contracting, however, there often is no clear delineation of when an appointment to government office is "cronyism". It is not unusual for a politician to surround him- or herself with highly qualified subordinates, and to develop social, business, or political friendships leading to the appointment to office of friends, likewise in granting government contracts. In fact, the counsel of such friends is why the officeholder successfully obtained his or her powerful position – therefore, cronyism usually is easier to perceive than to demonstrate and prove. However, "The practice of favoritism based on relationships and connections - rather than someone who demonstrates top credentials and well-suited experience – ultimately results in vastly inferior government service to the public." Moreover, cronyism describes relationships existing among mutual acquaintances in private organizations where business, business information, and social interaction are exchanged among influential personnel. This is termed crony capitalism, and is an ethical breach of the principles of the market economy; in advanced economies, crony capitalism is a breach of market regulations, e.g., the Enron fraud is an extreme example of crony capitalism. Alexander Hamilton as the first U.S. Secretary of the Treasury after Hamilton had served as Washington's aide during the American Revolutionary War. Nonetheless, the contributions Hamilton made to stabilizing the currency and securing outside capital for the fledgling republic are well known. Referring to Hamilton's appointment as cronyism seems particularly disputable in retrospect, although it is only after looking at his accomplishments that this determination can be made. Appointing cronies to positions can also be used to advance the agenda of the ruler responsible for the appointment, and it can also spectacularly fail to do so. In medieval England, King Henry II arranged the appointment of his good friend Thomas Becket to be Archbishop of Canterbury. Henry believed that Becket would promote the king's agenda but was dismayed to see Becket adhere to his own conscience. Becket eventually excommunicated the king and the king allegedly incited three knights to murder Becket in response. Examples of cronyism can be found historically in a number of communist states. The cultural revolution in China was initially popular due to the perception that Mao Zedong was ridding the state of a number of officials who had obtained their positions by dint of friendship with communist authorities. The nomenklatura system, which existed throughout the life of the Soviet state and came to prominence in the time of Leonid Brezhnev is another notable example. The business and labor community have also seen charges of cronyism. U.S. President Theodore Roosevelt led an attack on cronyism against the oil, steel, banking and other businesses that had conspired to set prices by maintaining virtual monopolies through cronyism. Through interlocking directorates it was not uncommon to see various corporate boards share members among each other. One of the highest level cases of cronyism occurred during the Kennedy administration in the United States. Robert S. McNamara was appointed by President John F. Kennedy without any experience, a point that McNamara made clear in the 2003 documentary The Fog of War. McNamara's role in the Vietnam War was crucial and he is often considered "the architect of the Vietnam War". Kennedy originally offered him a job as United States Secretary of Treasury and when McNamara admitted to having no experience he gave him Secretary of Defense. Even though McNamara confessed no experience in defense, Kennedy insisted he accept the position. Former US President Harriet Miers to the US Supreme Court. Miers had no previous judicial experience and demonstrated little knowledge of constitutional law, and her selection was rejected by many conservatives and liberals. The appointment of Michael D. Brown to the head of the Federal Emergency Management Agency (FEMA) would also be considered a case of cronyism, as Brown had no experience pertaining to his job. The administration has also been accused of cronyism for reducing Scooter Libby's sentence in the Plame Affair. Paul Wolfowitz was mentioned in connection with cronyism after the World Bank committee charged him with violation of ethical and governance rules as bank president by showing favoritism to his companion in 2005. The report noted that Mr. Wolfowitz broke bank rules and the ethical obligations in his contract, and that he tried to hide the salary and promotion package awarded to Shaha Riza, his companion and a bank employee, from top legal and ethics officials in the months after he became bank president in 2005. Tony Blair, former British Prime Minister, was accused of cronyism when he started creating large amounts of Labour Life peers to go into the House of Lords and removing Hereditary peers from the House of Lords in 1999. In 2007 he was also connected with cronyism for wanting to give personal friends life peerages. These became known as "Tony's Cronies. ^ McDermott, Peter (14 December 2010). "Less dogma, more dialogue needed in economics". The Irish Echo (New York). OCLC 4988765.